Karan Johar unveiled his wax statue at Madame Tussauds, Singapore on Thursday morning. The filmmaker shared a picture of himself along with his wax statue and wrote: "Waxed at Madame Tussauds! What fun with my mom Hiroo Johar, my family and my surprise from friends who are too shy to be named." Karan Johar's protege Varun Dhawan also congratulated the filmmaker in a special way. The actor shared a picture of Karan along with his wax statue and captioned it: "With the boss. Couldn't be there to congratulate you in person but hey, I'm still there in wax." Meanwhile, Gauri Khan Malaika Arora, Farah Khan, Manisha Koirala, Punit Malhotra, Sophie Choudry also congratulated Karan Johar. Gauri Khan shared Karan's post on Instagram and wrote: "Love the look Karan." Kajol and Karan Johar are a part of a close-knit circle, which also includes Shah Rukh Khan and filmmaker Farah Khan. Kajol has also featured in many of Karan Johar's films. The duo have worked together in films like Kuch Kuch Hota Hai, Kabhi Khushi Kabhie Gham... and My Name Is Khan. The dynamics of Karan Johar and Kajol's relationship changed in 2016, during the box office clash of Karan Johar-directed Ae Dil Hai Mushkil and Ajay Devgn-led Shivaay. 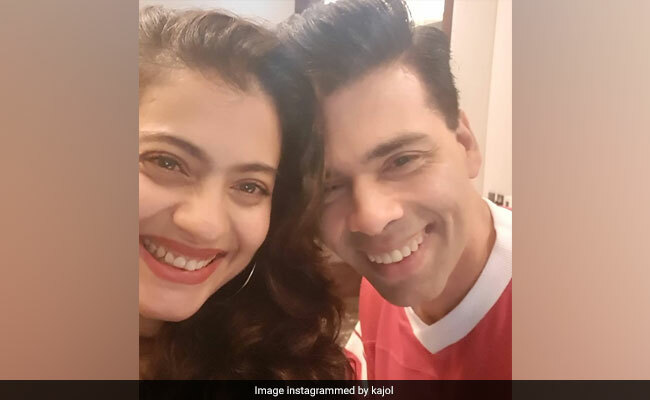 Karan Johar even wrote about how his fight with Ajay Devgn hampered his relationship with Kajol in his autobiography, titled An Unsuitable Boy. However, Kajol and Karan brought an end to their prolonged fight and Kajol and Ajay Devgn even made an appearance on Karan Johar's talk show Koffee With Karan 6 last year.